This was the final round of Iron Painter. You can see my other entries by clicking on this link. As this was the last round I found this entry a challenge to paint. I've been working on the entries for this competition for several months now. This entry was one of the most challenging as I had so little spare time. I only finished painting the model 8 hours before the deadline. I stayed up until 1 am trying to get a decent picture. The composite image for the competition. I tried a few new things with each model. The base was an experiment to see how well I could recess the resin bases into a matching display base. The convict gunslinger was my first attempt at painting stripes like that. I painted the whole cloth area white and shaded and highlighted it before doing the same to the black stripes. The large arachnid fit like a jigsaw puzzle to assemble. I painted it in metallics to match my other Ramos models. It isn't very painterly for the painting competition part though. I didn't have near enough time to really get in to blending each surface for good true metallic metals. I'm pleased to have finished entries for every round of the competition. My goal at the start was to survive in bronze until the end. 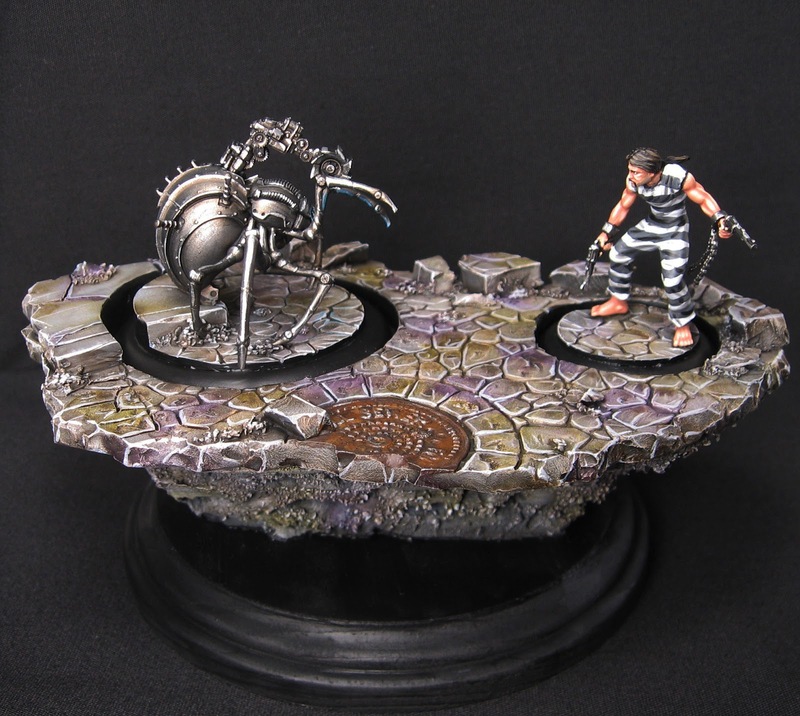 I'm in the bronze tier but I think I will lose this round as my competitor has produced a very nicely painted piece. Be sure to visit again soon. 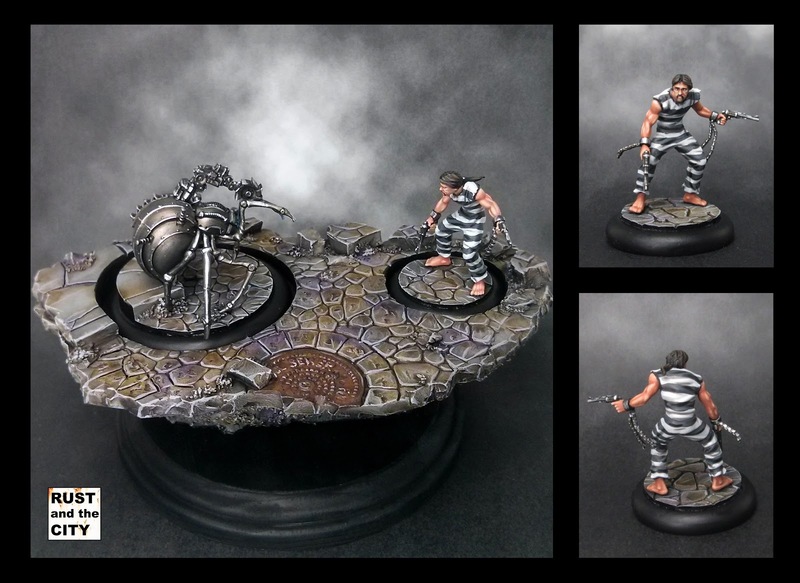 I have some German AA nearly done and some more Malifaux models to paint before a tournament in July. As always, thank you for your comments and support. The comments and interactions with everyone who stops by are often what motivates me to finish my projects. Thanks! Beautiful models. I wish these particular bases weren't beveled. Flat edges would have given you a much closer fitment and not created those large black rings. Wonderfully done regardless! Yeah, that's the biggest downside to the rounded edge base. Doesn't fit as well when you try to blend it in to a display piece. Damn fine work. And way to pile on the stress by painting black and white and skin tones on the same mini under the pressure of a deadline o_O Came out great though! Haha, yes. It was was tricky for sure. Whilst perhaps not your best work, they "are" very lovely mate and the composition of the scene set is pretty good. Gives me the feel of a Cowboy Beebop anime style standoff. You've done really well to keep up this production rate too throught the challenge - good job! Yeah, definitely not my best. The arachnid was challenging to paint. Would have taken another 8 hours to shade the metal how I wanted to. My god Cam "another 8 hours" I can paint an army in eight hours ;) They both look spectacular! Well, it impresses the hell outta me! Thanks. They are 32mm scale. Slightly taller and more slender than say Bolt Action models or GW Guardsmen. Sorry for the slow replies. Lots of your replies got caught in the spam filter!